PC Matic first tested with AV-Test in the fall of 2017, and earned its first AV-Test certification at that time. 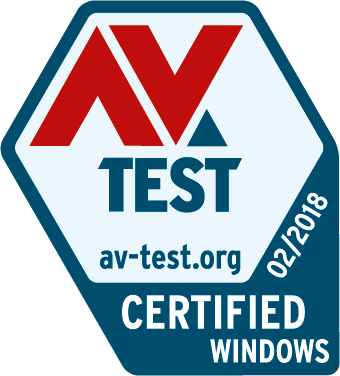 In January and February of 2018, AV-Test conducted another round of testing in their Home Windows test category. The testing resulted in AV-Test awarding PC Matic 3.0 with another AV-Test Certification after achieving high marks across their protection and performance testing. PC Matic‘s Super Shield was able to block 100% of the real-world ransomware/zero-day threats used in the test set, further demonstrating that taking an approach that centers around prevention instead of remediation continues to show its importance. Ransomware infections not only require a ransom paid to recovery encrypted files, but recovery efforts and time lost for the business often cost far more. In addition, PC Matic out scored other tested security solutions in performance measures. According to the industry averages, PC Matic was over two-times more efficient than alternative programs. Due to this level of efficiency, PC Matic had a lower impact on the computer’s speed during daily usage. In the usability category AV-Test penalized our score for returning a small number of false positives. The false positive test used by AV-Test is extremely robust, with over 1.5 million known good samples. After being tested against those samples, our highest number blocked was 41. This comes down to .004% false positive rate or 99.996% good file accuracy. The number of false positives our users see in the real world is often even lower and further shows that our patent pending globally automated whitelist is a truly innovative approach. To read the full Q1 2018 PC Pitstop newsletter, click here. Newsletter, PC Matic Blog, Q1 2018 Newsletter AV-Test, certification, pc matic. permalink. I had this program last year. Got new computer they gave tbisme back up. Now its going to stop. I would like to get PC back. How do I do that? My computer has lost several of its programs. Including all icons for PC MATIC. This happened on a Friday three weeks ago. The device was was not used until Monday of the following week. Now I m faced with losing a lot of information. Since I have PC matic will I get help to rectify my problem? ?